When it comes to creating a garden, the most difficult thing is often the starting point: selecting the first type of plant. Then, from there, companion plants that display complimentary colors and textures, and share similar cultural requirements, are selected. Here's a simple garden design featuring my favorite hummingbird attracting plant: Major Wheeler Honeysuckle, combined with some of the best and most hardy sun-loving flowering perennial and ornamental plants that hummingbirds also love. 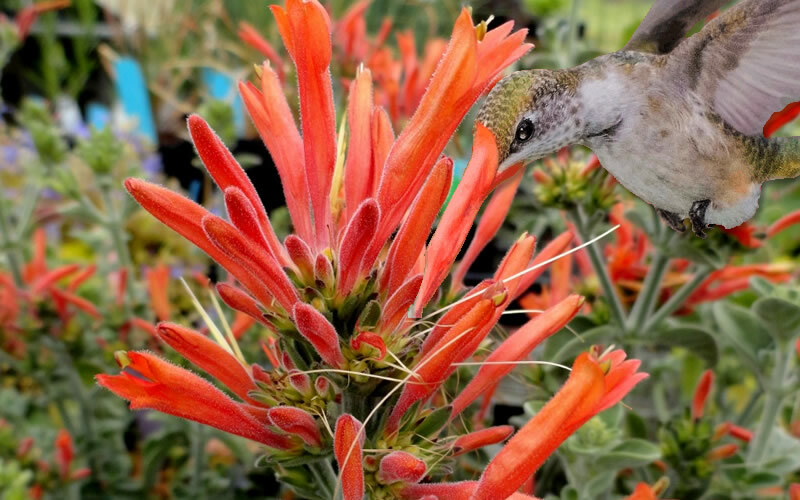 When planting these together in a garden you'll be creating an irresistible nectar buffet for hummingbirds, and they'll be sure to find it, not too mention reward you with their presence! Note: You can substitute any of these with other plants in the same genus. Blooms 10 months straight - your hummingbirds will never go hungry! In late winter or very early spring, abundant dangling clusters of radiant-red trumpet-shaped flowers appear and continue all the way through fall and into winter. The flowers were perfectly designed by mother nature for hummingbirds to feed on, and they find them irresistible. Here in our north-central Georgia gardens, Major Wheeler Honeysuckle seems to always be in bloom...at least 10 months out of the year. When there's a mild winter it'll bloom year round, as it did in 2016 in our gardens when there wasn't a day that went by when the vine didn't have blooms on it! We have Major Wheeler growing over an entryway arch in our gardens. In just two years it has densely covered the 8-foot high by 5 foot wide wooden arch and put on a spectacular show. It's near a sitting area so we can relax and watch the hummingbirds feed all day long. 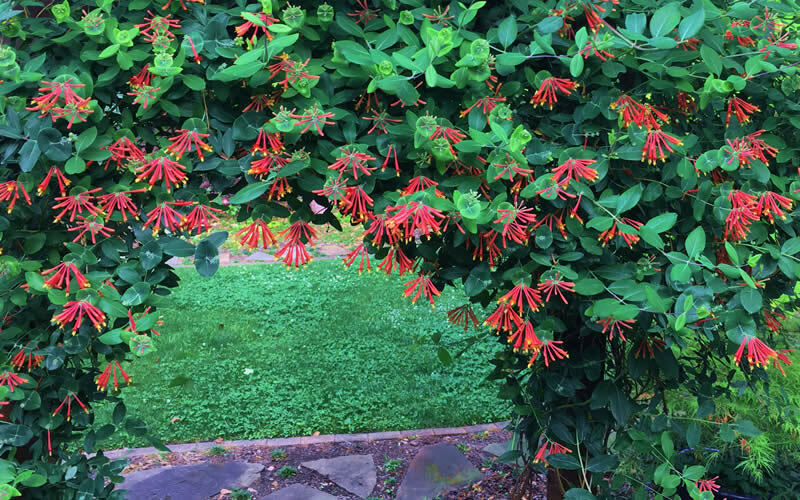 Growing 10 feet or more tall or long and 2 to 3 feet wide, Major Wheeler Honeysuckle is a perfect vine for use to climb along the top of fences, on a trellis, on a mailbox, over an arch, arbor or pergola, or any other structure that will provide something for the vines to twine around. You might be happy to know that the vine does not produce aerial roots that cling to walls or other surfaces. A hummingbird's dream come true! 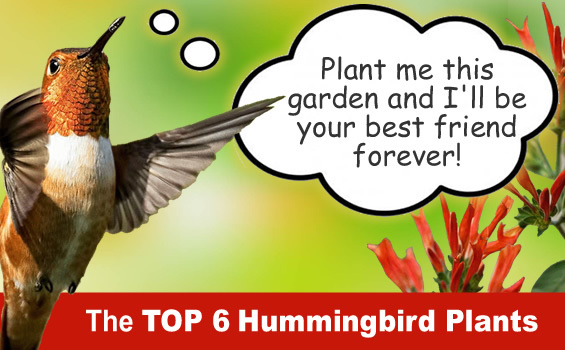 If attracting hummingbirds is one of your goals the Hummingbird Plant is a must for your garden. Scientifically known as Dicliptera suberecta, this is one of the few perennials from Uruguay that we grow and offer...makes you wonder what else might be there. This heat and drought tolerant perennial plant produces electric orange tubular flowers that are perched in upright-facing clusters at the top of sturdy, grey-leaved stems. 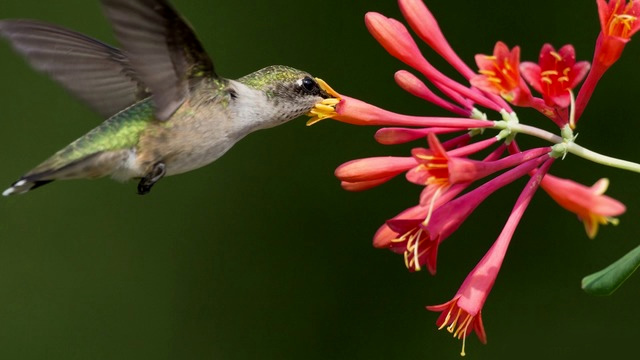 The flowers are produced throughout the warm season when hummingbirds are around and hungry, and they're sure to find these bright, nectar-rich flowers. Equally attractive in the garden are the felty, silver-grey leaves that cover the 2 foot tall by 3 foot wide mound throughout the growing season. 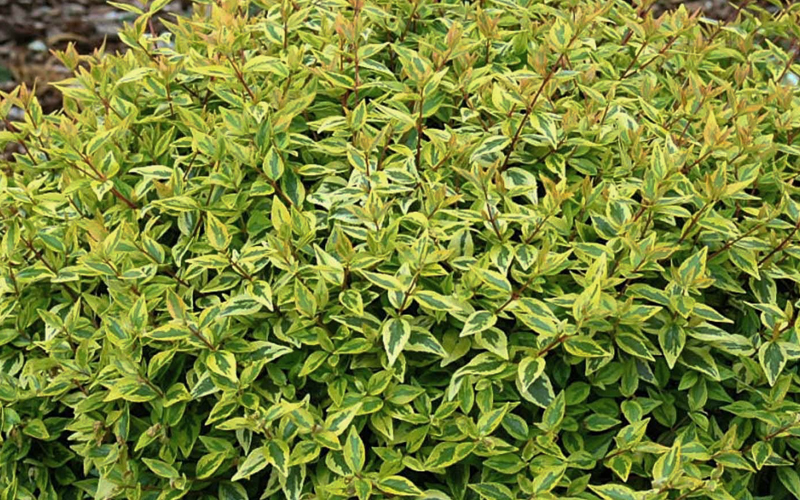 A WILSON BROS INTRODUCTION, Lemon Lime is a dwarf Abelia that sports tricolor leaves of bright yellow, white and dark green, making it a standout in the landscape. An abundance of fragrant, pale lavender to white flowers are produced during summer and into fall. Though the flowers are inconspicuous against the bright foliage, butterflies and hummingbirds will be sure to find them! The lowest growing Abelia in our gardens, Lemon Lime grows in a dense mound to only 2.5 to 3 feet in height with an equal to slightly larger spread. It has demonstrated exceptional resistance to drought, insects, and disease, and deer turn their nose up to it. The purple petunia-like flowers only last for a day, but they are numerous and keep coming and coming and coming all season long! 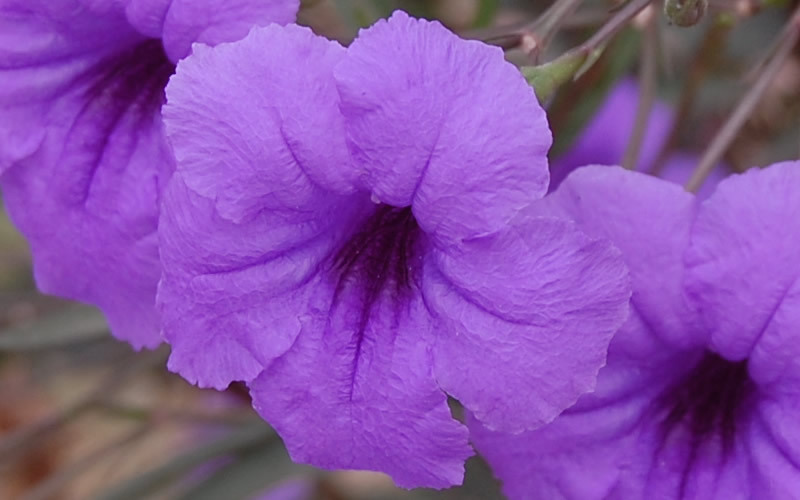 'Purple Showers' Mexican Petunia, scientifically known as Ruellia simplex, is an exceptionally versatile and easy-to-grow hardy perennial in USDA Zones 8a-11. In zones north of 8a it can be grown as an annual in flower beds or in containers that can be overwintered indoors. The plant forms attractive clumps of erect, deep purplish stems that are clothed in dark-green, willow-like leaves tinged in purple, making it a great vertical accent in the garden that also provides a unique texture. The 2-inch purple flowers are produced in abundance from late spring through fall - year round in zones where it remains evergreen. It's not really a petunia, but just as with petunias, butterflies and hummingbirds will flock to the flowers! Back in 1995, 'New Gold' Lantana won the Georgia Gold Medal Award for it's outstanding attributes, characteristics and overall performance in the garden. 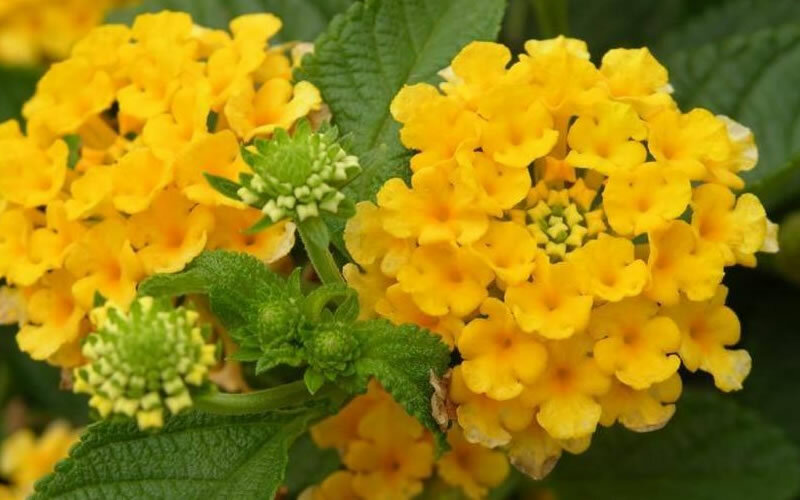 It is still considered to be one of if not the best of the low-growing hardy lantanas. New Gold is one of if not the most profuse bloomers of all the Lantana varieties we grow in our gardens, rivaling Trailing Lavender and Chapel Hill Gold. All summer long and well into fall, the trailing mounds are literally smothered in bright golden-yellow flower clusters that butterflies and hummingbirds are sure to find and flock to! The plant grows to about 12 to 18 inches tall and spreads to about 3 to 4 feet wide over time, making it a perfect selection for a low border, in groupings or mass plantings, or to cascade over a wall in the landscape. It also serves very well in pots and hanging baskets, which can be overwintered indoors for those of you who live and garden north of USDA Zone 8a. Lo & Behold® Blue Chip is probably our favorite among the many varieties of dwarf butterfly bush we have growing in our gardens. It produces LOADS of 3-4" long, honey-scented, blue flowers and doesn't require deadheading. That said, sometimes we'll deadhead the ones we have growing in pots, which are situated in sitting areas where plants will be viewed from close up. Whether you choose to deadhead or not, the flowers just keep coming and coming all the way to frost, attracting both butterflies and hummingbirds. As with all butterfly bush, this one is drought tolerant when established and deer turn their nose up to it. We have Blue Chip growing in both garden beds and pots in our landscape. 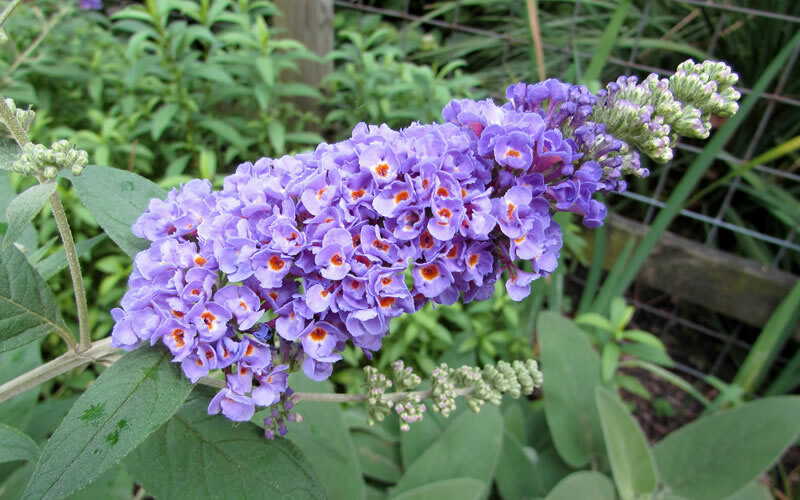 In the ground, it's 3 foot height with an equal or slightly wider spread make it an ideal choice for smaller garden spaces, where larger growing butterfly bush just won't fit. In containers it doesn't grow quite as large, maybe 2 feet tall by 2 feet wide or so. That said, we'd recommend a larger pot of at least 15 inches or more in diameter. The Hummingbird Garden Design below was designed using the Major Wheeler Trumpet Honeysuckle as the feature plant on a post, pole, obelisk, sturdy trellis, shepherd hook, or other form of support, surrounded by the companion plants that were shown above. Use the design "as is" or modify it to fit your unique garden space. 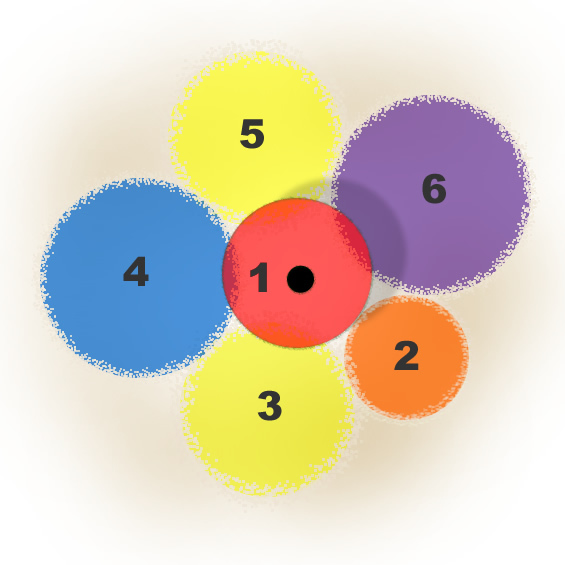 Sunlight Preference: All of the plants in the design below are sun-loving, which means they like full sun to mostly sun. That said, they tolerate some light shade. I suggest 6 hours or more of direct sunlight per day during the spring, summer and fall seasons. NOTE: If when you get to the plant page, you find that we are temporarily out of stock on a plant in the list below, put your name on the Waiting List and we'll notify you by email when the plant is available again.